The TIZIP zippers used by ORTLIEB consist of a strong plastic coil zipper on a high strength fabric. Sealing zippers are harder to move than conventional zippers, and need to be maintained by applying a lubricant at regular intervals. Products with TIZIP zippers are suited for all fields of applications which require protection against humidity and dust on the one hand, and ask for fast access on the other hand. The zipper is made from a strong, plastic coil zipper on a high strength fabric. Every coil half is safely embedded and secured in a plastic profile. When the TIZIP is closed, the sealing lips above and below the coil are compressed making a perfect seal. The unique design prevents the slider from wearing down the sealing lips when the zipper is opened or closed. Further, the plastic profiles are highly abrasion-resistant. The physical design of the TIZIP increases the seal strength when the pressure is raised or when cross tension is applied. Both actions lead to an increased mechanical pressure on the top sealing lip. 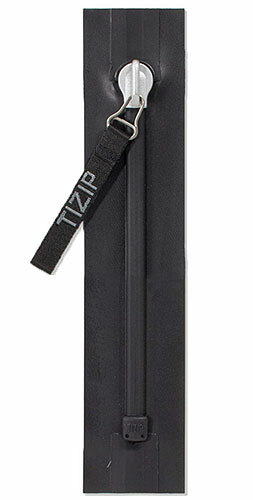 The TIZIP zipper is highly resistant to damage caused by dirt or sand. However, if dirt or sand are present, the zipper should be cleaned with soap and water. Dirt particles can affect the sealing function, if they get caught between the chain profiles. The zipper will prove its stability and durability even under most tough conditions. It is shock-proof, highly abrasion-resistant, and it will survive short-term sharp bending and twisting without separating. When closed, the zipper has a cross-breaking strength of minimum 300 N/cm. The sealing function of the zipper results in a tough movement of the slider. It is only a matter of course that it moves a little bit “harder” than regular zippers. The handle with puller allows an easy operation. Humidity or the TIZIP lubricant will improve the sliding function. However, in the event of overstressing the zipper during closing, the chain may stay separated. The closure remains open, but the TIZIP will not be damaged by this. In this case, simply move the slider back, reduce the cross tension, and then reclose the zipper. If the zipper has opened all the way down into the bottom stop, the first min. 2 cm have to be closed by hand before the slider is pulled back.